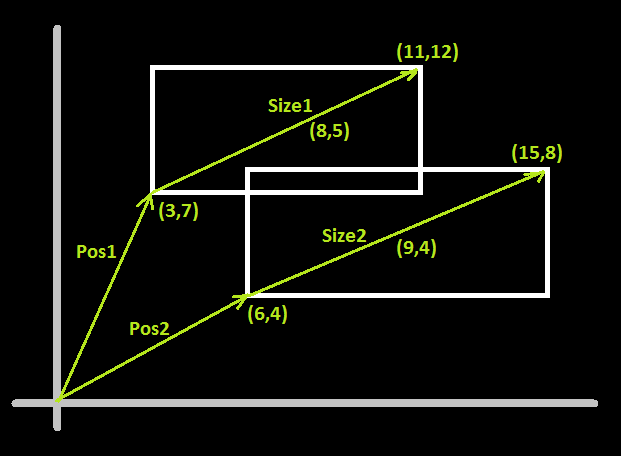 I am trying to write a C++ program that takes the following inputs from the user to construct rectangles (between 2 and 5): height, width, x-pos, y-pos. All of these rectangles will exist parallel to the x and the y axis, that is all of their edges will have slopes of 0 or infinity. I've tried to implement what is mentioned in this question but I am not having very much luck. However I'm not quite sure if (a) I've implemented the algorithm I linked to correctly, or if I did exactly how to interpret this? NOTE: TO ALL SO USERS WITH EDIT AUTHORITY. PLEASE STOP FIDDLING WITH THIS. Therefore, a sufficient condition for Overlap is the opposite. Note 1: It is fairly obvious this same principle can be extended to any number of dimensions. Note 2: It should also be fairly obvious to count overlaps of just one pixel, change the < and/or the > on that boundary to a <= or a >=. To already receive a positive result when touching only, we can change the "<" and ">" by "<=" and ">=". Ask yourself the opposite question: How can I determine if two rectangles do not intersect at all? Obviously, a rectangle A completely to the left of rectangle B does not intersect. Also if A is completely to the right. And similarly if A is completely above B or completely below B. In any other case A and B intersect. In the question, you link to the maths for when rectangles are at arbitrary angles of rotation. If I understand the bit about angles in the question however, I interpret that all rectangles are perpendicular to one another. 3) create a 2D array by number of gaps between the unique x coordinates * number of gaps between the unique y coordinates. 5) As you paint the rectangles, its easy to intercept the overlaps. Don't think of coordinates as indicating where pixels are. Think of them as being between the pixels. That way, the area of a 2x2 rectangle should be 4, not 9.
first of all put it in to your mind that in computers the coordinates system is upside down. x-axis is same as in mathematics but y-axis increases downwards and decrease on going upward.. if rectangle are drawn from center. if x1 coordinates is greater than x2 plus its its half of widht. then it means going half they will touch each other. and in the same manner going downward + half of its height. it will collide.. Lets say the two rectangles are rectangle A and rectangle B. Let there centers be A1 and B1 (coordinates of A1 and B1 can be easily found out), let the heights be Ha and Hb, width be Wa and Wb, let dx be the width(x) distance between A1 and B1 and dy be the height(y) distance between A1 and B1. I have implemented a C# version, it is easily converted to C++. now the only way these rectangle will overlap is if the point diagonal to x1,y1 will lie inside the other rectangle or similarly the point diagonal to x2,y2 will lie inside the other rectangle. which is exactly the above condition implies. A and B be two rectangle. C be their covering rectangle. It takes care all possible cases. This is from exercise 3.28 from the book Introduction to Java Programming- Comprehensive Edition. The code tests whether the two rectangles are indenticle, whether one is inside the other and whether one is outside the other. If none of these condition are met then the two overlap. A look at the matter from a different site. The case turns out to be quite simple if we look at the problem (algorithm) from the other side. It means that instead of answering the question: "Are the rectangles overlap? ", we will answer the question: "Are the rectangles do not overlap?". In the end, both questions resolve the same problem but the answer to the second question is simpler to implement because rectangles do not overlap only when one is under the other or when one is more to the left of the other (it is enough for one of these cases to take place, but of course it may happen that both will happen simultaneously - here a good understanding of the logical condition "or" is important). This reduces many cases that need to be considered on the first question. Even if we have a different representation of a rectangle, it is easy to adapt the above function to it by modifying only the section where the variables changes are defined. The further part of the function remains unchanged (of course, the comments are not really needed here, but I added them so that everyone could quickly understand this simple algorithm). If area = 0 then they don't overlap. Not the answer you're looking for? Browse other questions tagged c++ algorithm geometry overlap rectangles or ask your own question. Method to detect intersection between a rectangle and a polygon? Efficient algorithm to find rectangles from lines?